TCM editor, Alex Gourevitch, will be speaking with Kathi Weeks, author of The Problem With Work, about ‘The Future of Work‘ this Sunday at PS1. It is part of Triple Canopy’s ‘Speculations on the Future‘ program. In advance of this event, we thought it worth laying out a few facts relevant to the discussion. While we have spoken about some of the political questions at stake in the work/anti work debate (here, here, and here), those were relatively fact free speculations. And necessarily so. The issue at stake was hopes and desires for the future, and the organizing aspirations for a possible left. These discussions, however, can always do with a small dose of vulgar empiricism. A brief look at some relevant facts suggests that the most likely, if not most desirable, future of work is roughly that of increasing dependence on the labor market and lower quality work for most people. One word of caution: the data is limited to the US and Europe, entirely because that is our area of expertise and where the data is most readily available. Although every so often there are breathless declarations of the end of work, the collapse of work, and that technology is leading to a world without work, the historical trend is the opposite. Ever since the 1970s, an increasing share of the population has been working. 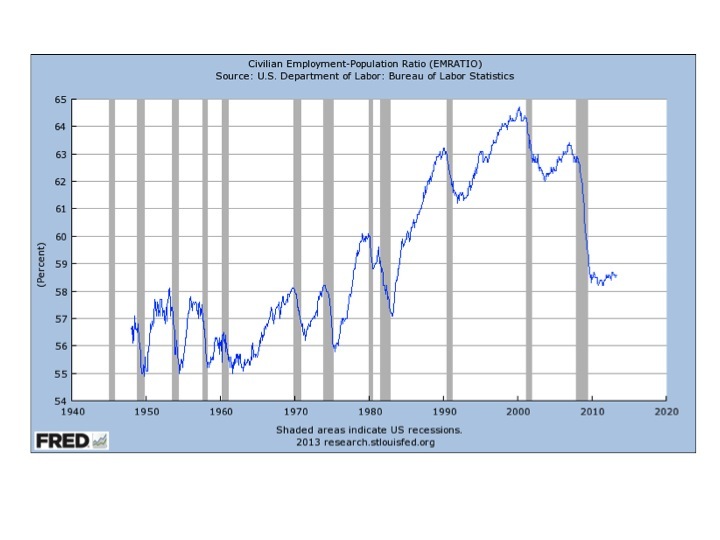 For instance, the graph below shows the employment to population ratio in the United States. Notably, even after the dramatic post-2008 decline, a higher percentage of Americans still work in the formal labor market than anytime before the mid 1970s. Similar survey data from Eurostat of all people between ages 15 and 64 shows, wherever data is available, that there have been dramatic or gradual declines in ‘inactivity‘ or non-participation in the labor market. In Germany, 35.9% of 15 to 64 year olds were inactive in 1983 while in 2012 that number had sunk to 22.9%. In Spain the drop was from 44.1% in 1986 to 25.9% in 2012. For France, 31.6% (1983) to 29% (2012), and the UK 29.1% (1983) to 23.7% (2012). The Netherlands saw the largest decline from 1983 to 2012, from 41.4% to 20.7%. The most likely future of work in the US and Europe is that more people will be working for wages or salaries than ever before, as absolute numbers and as a percentage of the population. Three recent changes to the political economy suggest not only increased participation in, but greater dependence on, wage-labor, especially by those on the bottom end of the labor market. These are a) stagnation or reduction of welfare benefits, b) stagnation or decline of wealth and c) stagnant wages and precarious employment. Welfare and wealth are alternatives to wages as sources of consumption; lower wages and precarious employment increases insecurity of and need for employment. For instance, in the case of welfare, the stagnation or reduction of welfare benefits means that states offer the same or worse benefits to those who cannot find or live off a job. This is consistent with increased numbers taking advantage of these benefits. For instance, recent reports made much of the 70% increase in Americans using food stamps, which represents a doubling of the amount spent on food stamps, since 2008. But food stamps alone are hardly enough to live off, and their increased use reflects the increase in unemployment. More broadly, American welfare benefits are not enough for most people to live off, many states recently cut benefits, and the welfare system is famously designed to spur labor market participation, not provide an alternative to it. Moreover, in Europe, where welfare benefits are more generous and less conditional, the consequence of austerity policies is, at best, to limit the growth of any such programs and in various countries to reduce or even eliminate them. Cuts to public employment and hiring freezes, increases in retirement age, and other measures mean the reserve army of labor will be larger, and most people will have fewer/poorer state provided alternatives to finding a job. Finally, the increase in part-time, low-wage work, alongside stagnant or declining wealth at the bottom, further entrenches labor market dependence. We were unable to find longitudinal wealth data on Europe, but in the United States we have seen net declines in wealth for the bottom 60% of the population. Since wealth assets are not only an alternative source of income, but also, in the US especially a source of retirement income, this means greater dependence on the labor market for the working age population, as well as postponement of retirement, further swelling the ranks of the labor market. On top of which, wages remain stagnant and full-time work harder to find. Jobs are low-paying, part-time, and insecure and once one starts looking not at median but bottom quintiles, the situation is only worse. These trends are equally evident in Europe, where part-time, less secure employment has increased in places like the UK and Netherlands, alongside the more often commented increases in unemployment in places like Greece, Spain and Portugal. In all, then, we can say that alternatives to employment have gotten worse or disappeared for the majority of people in the US and Europe, while the available jobs pay, on average, less than they used to and offer less security. There is every reason to think that the most likely near future of work will give us strong reasons to think about a different way of organizing work – about a better, if less likely, future. There is just one problem with this, everybody is dancing around the same fire. The ‘issues,’ whatever exactly that means, are a narrow set of disagreements over one resounding consensus: how to reduce the deficit. As Michael Lind recently put it, “Obama will almost certainly run as the candidate of authentic deficit reduction, as Bill Clinton and Walter Mondale did before him.” After all, who pushed for the Supercommittee on deficit reduction? Who bragged about being tough on welfare and having “helped lead the welfare-to-work effort in the Illinois Senate in 1997”? Who proudly proclaims “I signed $2 trillion of spending cuts into law”? Nor is this just a point about the presidential race between Obama v. Romney/Ryan. As we noted during last summer’s ‘debate’ over the debt-ceiling, the Democratic Party has been the party of balanced budgets for decades. In fact, for the Keynesians out there, one is far more likely to get deficit-spending out of Republicans than Democrats these days. In a way, Obama does not lie when he says Republicans “run up these wild debts” and says “I’m running to pay down our debt in a way that’s balanced and responsible.” It’s just that Republicans go for the most regressive and destructive deficit spending one can think of – war and tax cuts. Not all debts are wild, but those are. But of course, at the level of public debate, Republicans still beat the drums of austerity because they want to cut social services and public employment. A cause to which the Democratic Party has been increasingly willing to give its name. The Democrats and Republicans are disputatious members of the same tribe. The collective effervescence of the election is, above all, the reconstitution of elite consensus around a very limited set of differences on political economy. A number of our readers felt the previous post on mass incarceration was incomplete or didn’t have enough facts to support the claim that mass incarceration is fundamentally about policing the underclass. They were not convinced that mass incarceration is therefore not analogous to Jim Crow, which was not only explicitly racial, but about creating a docile agricultural proletariat, not policed underclass. In a quest for more facts we scoured the Bureau of Justice Statistics and Department of Justice websites, as well as independent websites, and discovered that statistics on incarceration based on race, and to a lesser degree gender, are a dime a dozen. BJS is drowning in them. But class-based statistics, or even weak proxies for class, like income and/or education, are much more difficult to come by. That alone tells us something about how our consciousness is shaped and continues to shape the gathering of information about this social problem. – 28% of state and federal prisoners were unemployed in the month before their arrest. The national unemployment rate at the time was 5.5%. So the inmate rate was six times the national average. – 88% of state prisoners and 80% of federal prisoners had a high school education or less. The national average for adults (over 18 years of age) was half that – 48%. Inmates are twice the national average. – 70% of state and 58% of federal prisoners had an income of less than $2000 in the month prior to arrest. That means they had an annual income of less than $24000. Median personal income in 2004 was about $34,000. 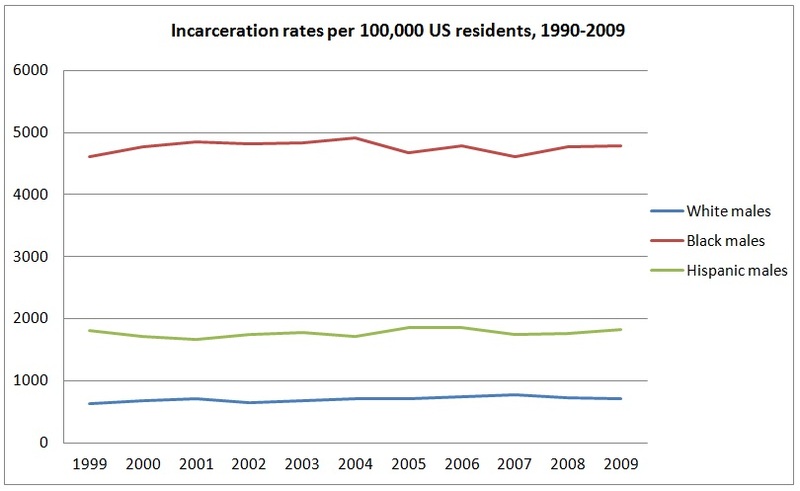 So about 2/3 of prisoners had incomes that were at least 1/3 below the median. By any reasonable measure (though not by unreasonable official measures) that is real poverty for households, and just scraping by for an individual. In other words, the poor, uneducated, and un/deremployed are the targets of mass incarceration. The surplus population. Racial factors undoubtedly play a role, especially in likelihood of conviction and length of sentencing, but far less than the ‘New Jim Crow’ thesis implies. Moreover, there is at least one way in which the present mass incarceration is importantly not a system of racial control. The data suggests that middle and upper class Blacks – like the rest of the middle and upper class – are much more immune to incarceration. One likely reason is that, like the rest of the upper and middle class, they can do their drugs in the privacy and much less heavily policed environs of their middle class homes and suburbs. This class cleavage, moreover, is one strong reason why, despite the much greater social and political influence of Black voters and leaders than in the Jim Crow era, mass incarceration gets little play in mainstream politics, and much less attention than other (middle class) ‘racial justice’ concerns like affirmative action. To support their ‘New Jim Crow’ interpretation, Acemoglu and Robinson draw on the work of David Oshinsky, whose book Worse Than Slavery examines the development of convict labor as the lynchpin of Jim Crow era black labor control. So it appears that there is a racialized system of social control, the present one analogous to the past one – a new Jim Crow. However, there are some very important differences between the political economy of the mainly agrarian, Jim Crow penal system and the current, urban system of mass incarceration. If the penal system functioned as a system of social control in both eras, the aim of that social control was very different. In the Jim Crow era, the central issue was how to get formerly slaves to work for their former masters on the plantations now that blacks enjoyed a nominal freedom. As Eric Foner showed in his classic Nothing But Freedom, turning former slaves into an agricultural proletariat is the central political question of all post-emancipation societies. The shift from coerced slave labor to forced wage-labor is not a natural one, and emancipated slaves often have a different idea about the freedom they ought to enjoy than former masters. As Foner showed, in the Reconstruction South, blacks preferred just about anything to selling their labor to former masters. They engaged in subsistence farming, moved to cities, and in some cases – such as in Edisto Island – they occupied former plantations and ran the farms themselves, until the end of Reconstruction brought an end to their political and social power and land was returned to former slave masters. The problem was not a ‘general’ one of how to control free blacks, but a specific modality of social control: how to produce a docile agricultural proletariat. Though Acemoglu and Robinson are sensitive to the thought idea that underlying Jim Crow was a particular “extractive regime,” they miss the way in which Jim Crow was a kind of exercise in primitive accumulation. One of the key features of primitive accumulation is the use of direct coercion until the wage-labor/capital relationship is naturalized – at which point Marx’s famous ‘dull compulsion of the economic’ takes over. The political struggle, at least for a brief time, during Reconstruction was whether emancipation would mean real liberation – Jim Crow settled the question securely in favor of former plantation owners, and the criminal law was the central instrument through which wage-labor was instituted. Note that just as the use of convict labor dwindles the prison population explodes. Where during Jim Crow convict labor and the criminal law was an appendage of the wider, Southern agricultural political economy, in the new era of mass incarceration it is imprisonment that is the point. Being jailed or being threatened with imprisonment is the instrument for containing the problems left by the failure of society to deal with mass unemployment not mass unwillingness to sell labor. 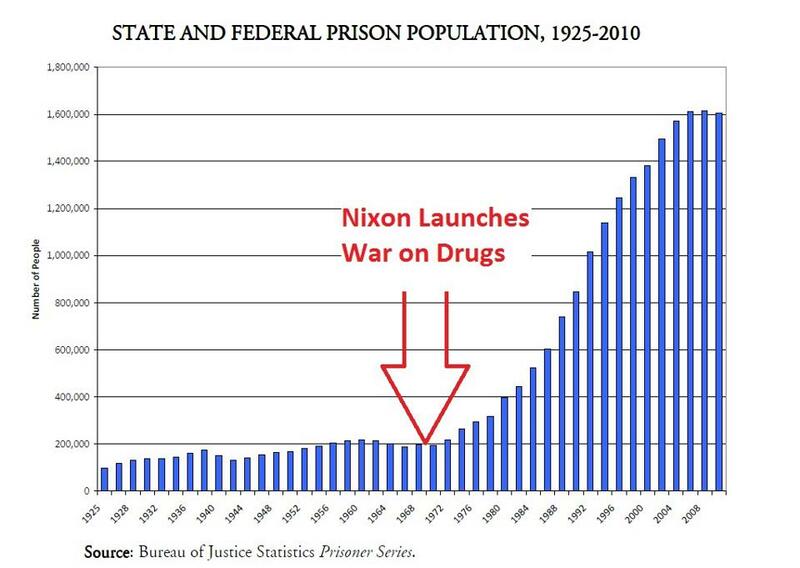 Put another way, under Jim Crow the point of criminalization was to create wage-laborers, under the drug war the point is to create criminals. In both cases, there are/were better alternatives. The freedmen could have been given forty acres and a mule. Urban blacks could be given jobs (not to mention legalize drugs) rather than rap sheets. But in both cases, blacks needed the political support of non-blacks – always a real though fragile possibility. And in both cases, the penal system served not just to control black populations, but also to divide them from their potential allies. Is the middle class doing worse or better since the 1970s? Depends, but if so, just barely. Is this the right question to ask? No. Let us explain. Recently, a number of commentators have begun pushing back against the claim that the past thirty years have seen stagnating fortunes for the middle class. The claim comes from a variety of sources, perhaps most prominently from Piketty and Saez’s work on inequality. They have argued that median incomes have stagnated and that, from 1979-2007, the median income is up just 3% in real terms. But other mainstream economists think the data answers a poorly framed question. Meyer and Sullivan, two mainstream economsits, argue that “material well-being” for poor and middle income households has increased. Burkhauser et al. claim that if we look at post-tax and transfer household income, rather than pre-tax and transfer individual tax unit income, then the median household had seen a gain of 36.7% in their overall income. Can everyone be right? Oddly, yes. The reason is that the difference here is not about the data – which we for the moment assume is more or less accurate – but the interpretation of the data. 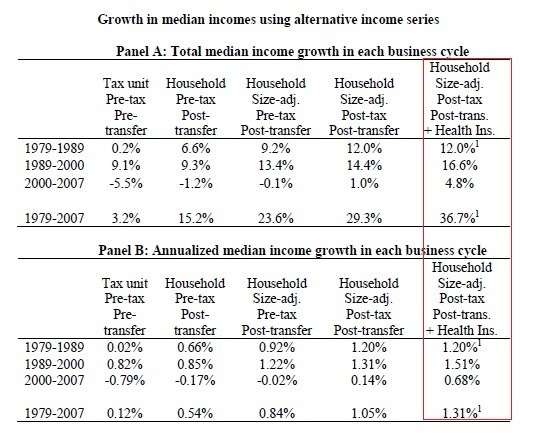 It is true that, as P-S say, the median, pre-tax and transfer individual median income is up just 3%. It is also true that, as Burkhauser et al. 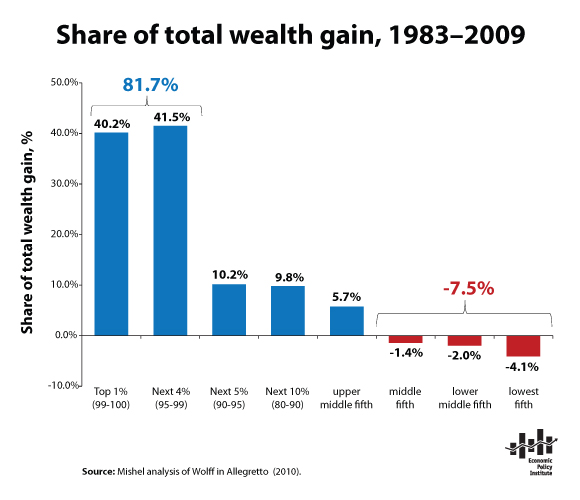 say, the median household post-tax and transfer income is up 37%, and that it is also true, as Meyer and Sullivan argue, that the material well-being of the poor is better than it was thirty years ago. That everyone can be right is only the beginning of the story. Let’s take Meyer and Sullivan first. Note that material well-being or ‘standard of living’ can improve even as the poor take home a decreasing share of the overall social product. It is perfectly reasonable for Meyer and Sullivan to point out that economic growth over the past thirty years has made more high quality goods and certain amenities (like air conditioning) cheaper, and thus available to those who couldn’t afford them. It would be hard to imagine capitalism surviving if it did not improve material conditions. But this improvement in the standard of living is perfectly compatible with increasing exploitation of workers. At least since Marx we have known that immiseration is not an absolute but relative process. We can have increasing living standards for many, while those same many control less of their time than before. If $100 used to buy a black and white TV and now it buys an HDTV, then that qualitative improvement in material human well-being is perfectly consistent with stagnating compensation, declining bargaining power and more injustice. It might take only three hours for society to produce all the things I can buy with $100 rather than the four hours it used to. And so, if all I have is $100, my overall claims on society have been reduced, even if the quality of my goods have improved. Put another way, if originally I had $100 and GDP was $10000, and now I have $100 but GDP is $20000, then just because I have higher quality goods doesn’t mean that my fortunes are increasing. It would of course be wonderful if we organized production for the sake of human needs, not profits. But it is pretty clear that is not Meyer and Sullivan’s interest in offering material human well-being rather than income and wealth as the measure of growth. Terry Eagleton once said that ideology works by being true in what it affirms but false in what it denies. It is true that standards of living have improved since 1970s, but it is false to think that refutes the concerns people have regarding inequality and growth. Again, his own terms, Burkhauser is right. Real compensation has grown. Though note, two things. First, real compensation has grown very slowly: 1% per year, and has slowed to a near stop in the past decade. Further, “real compensation” has grown mainly because redistributive state measures have been large enough to cancel out declining individual wages and stagnating household wages. In other words, the market has been unable to produce jobs at the median level that compensate any better than they did thirty years ago (and below the median, real wages are decidedly worse.) Without progressive taxation and redistribution, real compensation would be down. In fact, the implication of Burkhauser’s data is that, for most people, the market has not created better jobs than thirty years ago. The bottom end is hanging on through transfers, not bargaining power and quality work. So when Burkhauser says “the notion that we as a society are not doing as well as we were 30 years ago, I think by virtually any reasonable measure, is just false,” this is not even true by his own measures. It’s certainly not true by the conventional conservative standard that people not be dependent on the state. 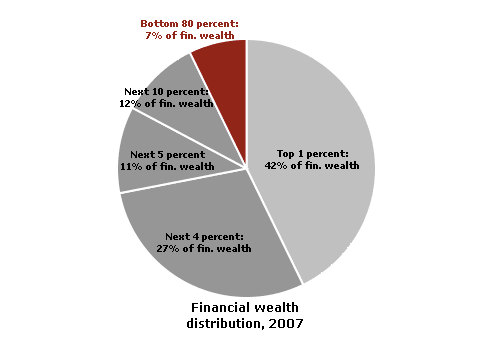 When we combine this graph, with some data on the actual distribution of financial (non-real estate) wealth, we are reminded why ‘median’ and ‘middle class’ are more ideological than they are analytical concepts. Those who have no reasonable alternative but to sell their labor, as diverse a group as they are, still constitute roughly 80% of the population. These statistics suggest that behind ‘median’ income and compensation there is a much different distribution of wealth, and thus a different class structure than concepts like ‘middle class’ can make sense of. We can ask even further questions – what kinds of jobs are being created, or could be created? Who controls job creation? Who has the freedom to ‘innovate’ and ‘create,’ and who serves the creators? An economy, after all, is never just about making new things, it is always about making new things under specific social conditions. Those social relationships always have to be reproduced, along with the goods and services that get produced. These are concerns about class structure and social power that mainstream economists are rarely interested in, but which cannot be dismissed by gesturing at living standards and compensation.